With the changes in the role of networking, server maintenance, and ownership in the federal government, it has become more vital to secure a solution that understands that role and how Agency standards and regulations interact and affect the networks. Adjuvant has provided networking solutions that apply the ever-evolving technology, standards, and regulations to ensure security compliance and connectivity for our customer base. Problem: The Department of Defense needed a secure and compliant network to provide connectivity for more than 3000 user base. 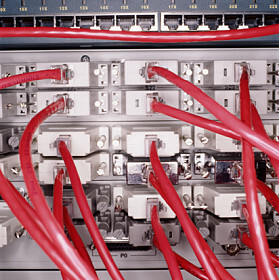 Solution: Adjuvant provided a network support team that was skilled with Firewalls, Switches, and Routers. The team deployed Cisco ASAs both to the home base and the squadrons and groups throughout the user base. Additionally, they ensured compliance with both agency standards and DISA standards to keep the network secure.